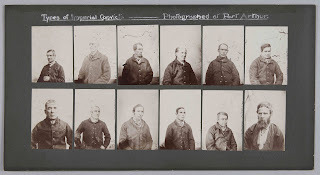 The forty individuals whose police photographs from the 1870s were lined up in this manner and pasted to dark green cardboard were all chosen by convictaria collector John Watt Beattie in 1915 because they were repeat offenders convicted of serious crimes who had been arraigned in Supreme Court sessions in the 1870s and incarcerated at the Hobart Gaol, Campbell St. Beattie chose them because he wanted to sell their images to tourists at his convictaria museum located in Murray St. Hobart, and include them in intercolonial exhibitions. He falsely touted these men as representative of the pre-1853 convict transportation era, hence the labelling on each of these panels, “Types of Imperial Convicts” and "Photographed at Port Arthur", when the reality was far less fascinating. 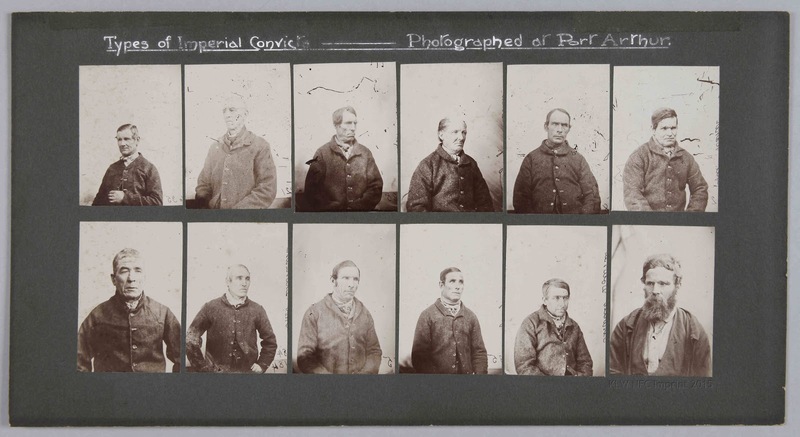 By the 1870s, these men were common criminals or “prisoners”, not "convicts" and they were photographed on sentencing at the Supreme Court Hobart and Hobart Gaol, a judicial process funded and administered by the Colonial government, not the British government. 5. 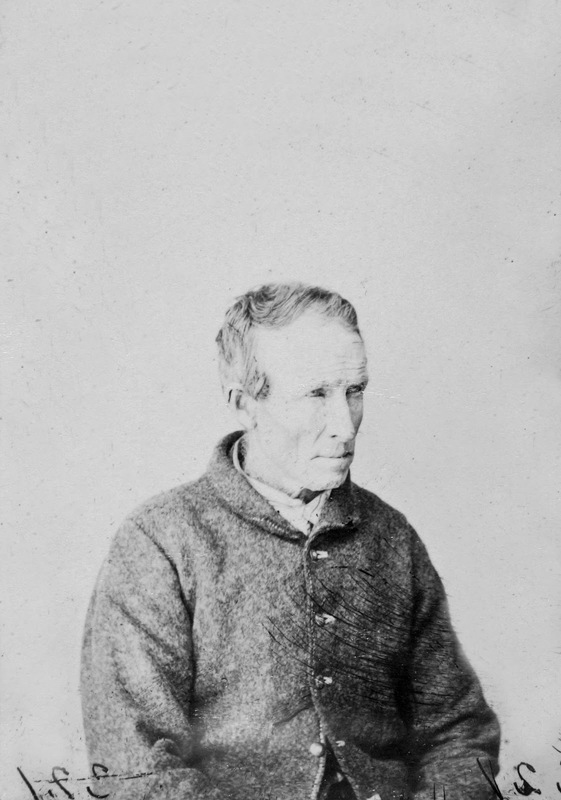 "Sling Shot" taken from Matthew Brady, the celebrated Tasmanian Bushranger, when captured by John Batman in 1820. Photographs from the glass negatives were produced in various formats, first as uncut and unmounted prints as in these 40 prints, and again in carte-de-visite format within an oval mount, a practice which persisted in Tasmania through the 1870s, 1880s and into the1890s. The same cdv was sometimes overlayed again in an oblong mount when the glass plate became too damaged for further use. All three photographic formats appear on the criminal record sheets of prisoners bound together as the Hobart Gaol record books dating from the late 1880s onwards, held at the Archives Office Tasmania. Some of the earlier gaol record books of the 1870s have survived, now mysteriously missing the prisoners' photographs. One possible explanation is that convictaria collector John Watt Beattie and his assistant Edward Searle removed the photographs or even destroyed the sheets in the early 1900s while trying to save the photographs, the bulk of which ended up at the QueenVictoria Museum and Art Gallery from their acquisition in 1930 of John Watt Beattie's estate. The glass plates themselves seem to have been disappeared altogether. They may have been shipped to Sydney, NSW, in March 1915 for an exhibition held at the Royal Hotel, Sydney to be displayed - reprinted and even offered for sale - as Port Arthur relics, alongside relics and documents associated with the convict hulk, Success. This newspaper report of the exhibition clearly states that the exhibitors - and this would have included John Watt Beattie as the Tasmanian contributor - collated original parchment records with duplicates, and also photographed original documents when duplicates were not available. Amongst the one ton of Port Arthur relics were dozens of original 1870s mugshots taken by Nevin, still attached to the prisoner's rap sheet; many more were removed for re-photographing in various formats as Beattie prepared for this exhibition. The association of Marcus Clarke's notes and novel For the Term of His Natural Life (1874) with these photographic records for the exhibitors was de rigeur by 1915. 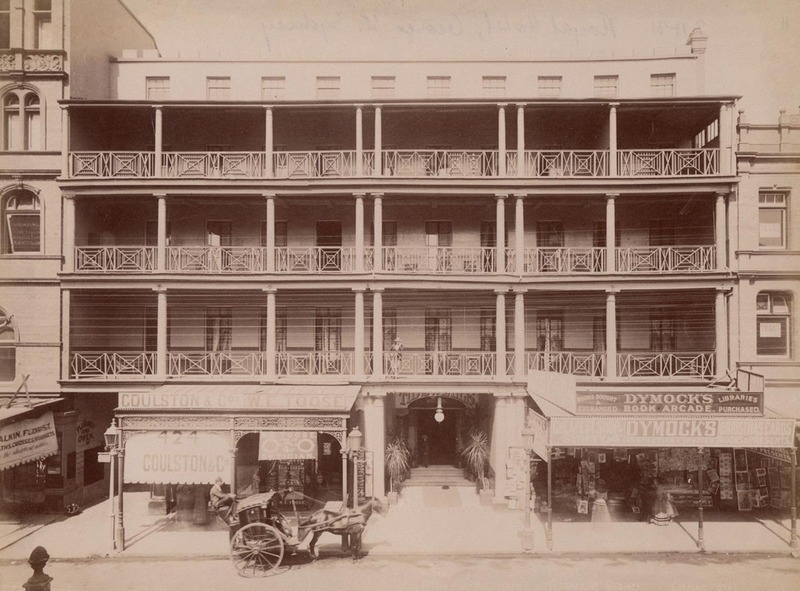 There is at present at the Royal Hotel, Sydney, an interesting collection of relics of early convict days. It has been brought over here by Mr. Fred McNiel, a member of a very old West Maitland family. Those relics are not exactly heirlooms, though they were handed to the family by a gentleman who had much to do with showing the world the social conditions of Australia 70 or 80 years ago. Mr. McNiel's uncle was Mr. John McNiel, who was associated with the infamous hulk Success when it was turned into a floating exhibition. It will be remembered that on the old convict ship many of the most notorious men who left England for England's good were caged like wild animals in a menagerie, and treated with a greater degree of severity by men who were more inhuman than the creatures they were called upon to guard. After a checkered career in Australia the hulk was taken to London and anchored in the Thames, when many people got their first ideas of Australian history from a visit to it. From there it was taken to America, and sank in New York Harbor. 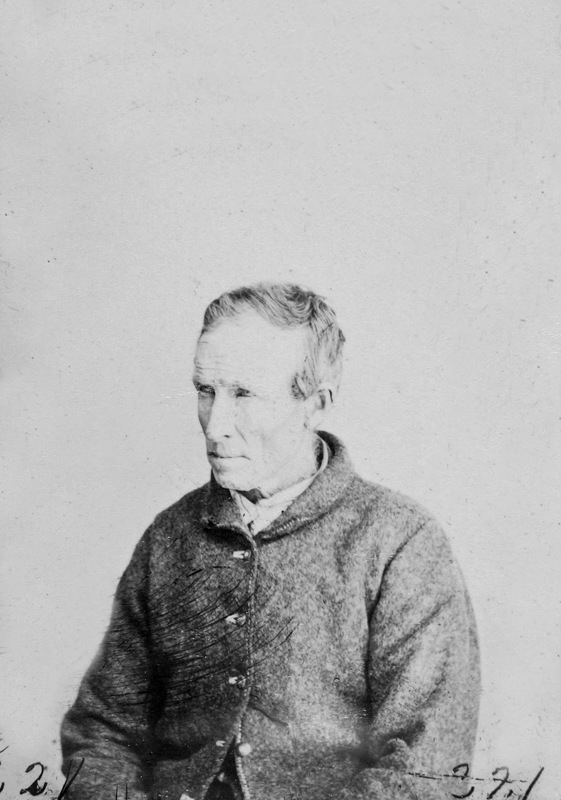 One example of excessive damage to the original glass plate is evident in this print taken from the negative of Nevin's only sitting with prisoner Peter Killeen in the week preceding the 20th January, 1875, when Killeen was discharged from the Hobart Gaol. He was given a life sentence for assault and robbery in 1856, and when discharged in 1875 with a ticket-of-leave, he was 64 yrs old. He subsequently re-offended, was sentenced to a further 6 weeks and discharged again on 29 September 1875. Peter Killeen offended again within six months of discharge. 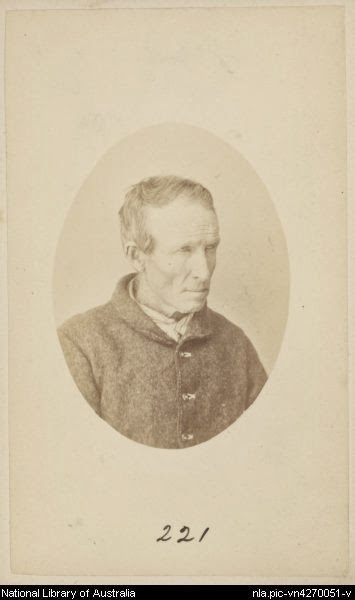 He was given a sentence of seven (7) years for larceny at the Supreme Court Hobart on 8th March, 1876, sent to the Port Arthur prison, arriving there on 6th April, 1876, and transferred back to the Hobart Gaol on 17th April, 1877. 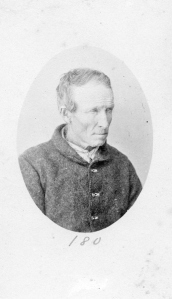 Peter Killeen died from senile decay, aged 76 yrs, as a Prisoner of the Crown at the Hobart Gaol on 27th June, 1889. See originals of these records here. The only image, whether extant as duplicates of the carte-de-visite or negative prints surviving from Peter Killeen's criminal sentences is the one taken by Thomas Nevin at his single sitting with the prisoner in January 1875. The scratched condition of the glass plate by the time of Killeen's death in 1889 at the Hobart Gaol is evidence of repeated use, the print showing even more wear and tear than the other 39 prints used by Beattie for the line-up of 40 on his three panels created in 1915. When amateur photo-historian Chris Long, on a visit to the Queen Victoria Museum and Art Gallery in 1985, re-photographed Nevin's original of Killeen, along with dozens more as black and white prints for reasons best known to himself since they serve no purpose (using a Canon EOS-1D Mark II), he eliminated most of the scratches and tears, but otherwise retained the numbering of the original. The mirror image on right shows the number "321", not "221" which has been transcribed onto the recto and verso of the NLA copy, and the verso of the QVMAG copy. Whatever the significance of the numbering or whenever it was scratched onto the plate/print, the fact remains that these prints and cdv's were handled extensively during the prisoner's lifetime career of crime up until he took his final breath aged 76 at the Hobart Gaol in 1889, when they were numbered for use in the daily administration of police and prison files. 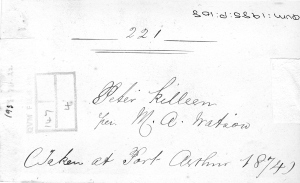 They were again handled extensively a few decades later as their use was elevated from vernacular police mugshot to tourist souvenir in the early 20th century, acquiring in the process a catalogue number on the cdv and the wording on the cdv versos, "Taken at Port Arthur 1874" to entice interstate visitors to the old prison site on the Tasman Peninsula. B & W print of T. J. Nevin's negative, 1875, of Peter Killeen, original and mirror with "321" visible. Inscription: title and "221"--In ink on reverse. Another duplicate from Nevin's original is held at the Queen Victoria Museum ad Art Gallery, bearing the number "180" on recto, but "221" on verso.